On Oct 28-29th, 2014 over 70 participants representing a diverse set of backgrounds and interest met to discuss all-things-aspen in South Lake Tahoe. The presentations included topics from restoration, fire recovery, climate change, birds, and even genetics. Presenters were mostly from the Tahoe area but a number of them traveled from out of state to share their aspen knowledge. Fire Expediters was extremely generous and donated the use of their fire bus to help us get such a large group of people out to the woods. A special thanks to all our presenters who travelled from near and far to share in this workshop. A pile burn in the newly restored Aspen stand. What is TEK? How does it apply to natural resource management? What makes partnerships with tribes successful? These questions and more were addressed in this workshop. I've put together a few key points from my notes but be sure to check out more information at the CA Climate Commons website! On the last weekend of June, I had the opportunity to backpack through the forests of Yosemite National Park and see these ecosystems through the lens of fire. The purpose of the trip was to provide information to Amy Quinton, a reporter for Capitol Public Radio. The station is putting together a series of radio programs and other resources about wildland fire in California. The trip was guided by Kate Wilkin, a PhD graduate student at UC Berkeley. With years of experience doing research in fire and frequent backpacking trips for field work, we were in very capable hands. Over 3 days we traveled ~16 miles by foot through the forests of the Illilouette basin. Frequent stops were made to record Kate’s knowledge for the radio program and to get images of the landscapes being discussed. Why was this area of Yosemite so important to showcase in the story of California Wildland fire? Forest here are considered fire resilient or fire restored. Here, when a wildland fire begins, it is allowed to burn (given certain conditions) rather than rapidly suppressed. This “fire use” has been going on here for decades now and is beginning to be modeled elsewhere. Walking through this slightly blackened but living forest was quite the contrast to the aftermath of some fires I've seen with acres of blackened snags and limited regeneration. While there were areas of high severity along our hike, these were often small patches just a leap and hop away from a low or moderate burn severity area. Kate explained how these represent the fire mosaic. It is this variation or “quilt-work” that is so important, to wildlife, biodiversity, and future fire behavior. As I am still new to the ecosystems of California, I learned a lot on this trip. But I won't spoil the radio story, you’ll just have to wait for more! Amy Quinton is still developing the radio programs and expects this and other fire stories to become available sometime in the fall. A website with photos and videos will also be available at that time. I’ll include the information about its release in the newsletter/social media when it’s ready. But for now, here are a few more amateur photos from the trip, taken by yours truly. On May 14, 2014 a diverse group gathered to visit sites throughout the UC Center for Forestry’s Blodgett Research Forest. The “Managing Forests for Future Resilience” field trip sponsored by the California Fire Science Consortium featured a variety of forest treatment activities that could be used to promote forest resilience. The treatment activities were implemented and monitored with the results on this handout. You can also check out the map of the sites. The field trip was joined by a group of foresters from Israeli which prompted some interesting discussions throughout the day. So what is resilience? During the first site visit, this concept and its application were described. Beyond being a popular buzz-word of the day, it’s a way of thinking about how much a forest system can change and still be a forest; a forest with similar functions and characteristics. For example, a severe fire could convert that a non-resilient forest into a shrubland. However, fuel reduction may create a more resilient forest that will still burn, but will remain a functional forest. The analogy of “a ball in a trough” was discussed (for a quick explanation of resilience, watch this video). Around 1915, areas of this forest were “blitzed” logged using a railroad system constructed for the purpose. This was a common logging practice during this time in the Sierra Nevada area. In some areas, as few as six trees per acre were left. Then came the era of fire suppression, which created the overly dense forests and heavy fuel loads (estimated: 35 tons/acre) in fire prone ecosystems. This fuel situation now creates high fire risk for human resources and forest ecosystem functions in some cases. With no treatment and no wildfires, the forest regenerated to a very high stocking level. With over 450 trees per acre currently on the site. The biomass in these areas continues to increase over time despite some mortality and fuels continue to accumulate in the understory. The importance of surface fuels on fire behavior was strongly stressed here. The risk that any wildfire in the area would kill most of the trees continues to increase from these fuels and fuel ladders formed by all the suppressed trees. This treatment removed merchantable logs with a feller – buncher. Then a large piece of machinery (masticator) ground up sub merchantable material with diameter less than 10 inches into smaller chips. The “mechanical only” treatment seemed to be the biggest winner of all the treatment types. Though a lot of material was removed, growth of biomass on the site (mostly in larger trees) continues to increase . Masticated material was very deep on the site (at least 18 inches deep in some areas) but was almost completely decomposed within 7 years, further reducing the fire risk. The moisture and fungi at this site were unusual for the region, causing faster chip decomposition than may be found in some areas of the Sierra Nevada. This treatment involved similar harvest as the mechanical site (with removal of logs and mastication of sub-merchantable material), but then the remaining activity fuels were burned within the same year. Because of the deep layer of masticated material, the fire was quite hot, with 6 foot high flames, and long fire residence times which scorched tree cambiums causing higher than desired tree mortality (especially to oaks). Tree vigor had not recovered at this site and biomass was not increasing. If researchers were to redo this treatment, they would wait several years between treatment and burning to allow the slash and masticated material to decompose and reduce prescribed fire intensity. The shrub regeneration was extraordinary here. The group had a discussion on the pros and cons of shrub regeneration. While shrubs are additional fuel and can increase fire risk (especially as they mature) they provide important wildlife habitat and forest diversity. The prescribed fire only treatment was burned twice, once in 2002 and again in 2009. “Putting a fire in the first time isn't restoration, its reclamation” said Scott Stephens, fire science professor at UC Berkeley and the study’s lead investigator. The first fire killed some of the standing trees. The second consumed the fire-killed trees that had fallen to the ground by that time. The second burn is more like restoration. Even though the tree vigor might be reduced by fire, it may be worth the price to lower risk. A discussion of grazing as part of the fuel reduction was prompted by the herd of cattle chased off during this site visit. Knowing the season and type of day to burn is vital to attaining the desired result. The "prescribed burn only" area was burned twice during the treatments and made a great spot for lunch. Blodgett forest managers worked with Placer County Air Quality to monitor the emissions from this massive slash pile burn. This showed that black carbon (one of the most damaging forms of emissions to climate change) was being released. Over 40 homes worth of energy was generated and the emissions (including black carbon) from the biofuel plants were far lower than a pile burn. The drawback is the cost of getting the material to the plant. To break even, biofuel plants need to be within 20-30 miles from the treatment site, this slash was sent to one over 75 miles away. Ways to subsidize the cost were discussed and the need for market mechanisms to encourage biofuel use of fuel reduction activities. This short video describes the outcome of the bio fuel and smoke emissions project. Conclusion: Which forest treatment is the best? ….it depends (you probably saw that coming). Most treatments kept the forest as a functioning ecosystem (created resiliency) and successfully reduced fuels. With each of these alternatives, other considerations such as cost, management objectives, time between treatments, site constraints, public opinion, etc. would factor into the determination of a “best” treatment. The Sequoia National Forest isplanning to ignite one of the largest prescribed fires in California history – one unit, planned for fall 2014, will be 3,200 acres. The entire burn will eventually cover 14,300 acres over 5 years within the Boulder Creek watershed. The project is currently waiting for the right time to burn, though they had planned a burn in October 2013, the federal government shutdown limited their window of opportunity. The timing of this first segment is partly based on weather and partly based on the ability to seize an opportunity created by another fire 3 years earlier. Paul Leusch, Fuels Officer for Sequoia National Forest, expects the higher humidity and shorter days of fall to increase fuel moisture so the fire doesn’t burn too intense in the 3,200 acre burn. He’s also using the boundary of the 2010 Sheep Fire to control the perimeter of the fire as it moves down the watershed. The Sheep Fire was a lightning-started fire managed for nearly 3 months for the ecological benefits that the fire brought to the area. It ultimately burnt 9,020 acres through Kings Canyon National Park and Sequoia National Forest. These types of low-intensity fires make forests more resilient to more intense fires by removing small trees, brush, and fine fuels; they also help cycle nutrients and create wildlife habitat. Leusch hopes that after treating the area with prescribed fire, managed wildfire can be used to maintain the forest. “We’re considering fire as a tool, “Leusch says. 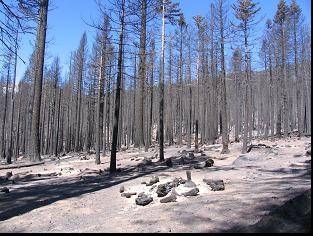 “It’s our hope to have a natural, unmanaged fire cycle and allow natural ignitions to occur.” Portions of the Boulder Creek watershed are in a wilderness area, so there are no roads and mechanical thinning operations are out of the question. “We don’t have road access so everything we need we have to take in by hand,” Leusch says. In such areas, managed fires – either through human ignition or lightning ignition – are often the only way to remove excessive fuels and restore the forest to a more resilient stand structure. The vegetation in the Boulder Creek watershed changes from red fir at the top of the ridge to mixed-conifer around the middle to a shrub/oak mix at the bottom near the Kings River. It also has three giant sequoia groves – trees that need fire to help with seedling establishment. The historic fire frequency in these vegetation types varies on average from a 5 year cycle at lower elevations to a 45 year cycle at higher elevations. [iv] But with years of no fire in the area, there has been a build-up of fuels. “This area hadn’t had fire in it for over 100 years and it was primed to go,” says Leusch. 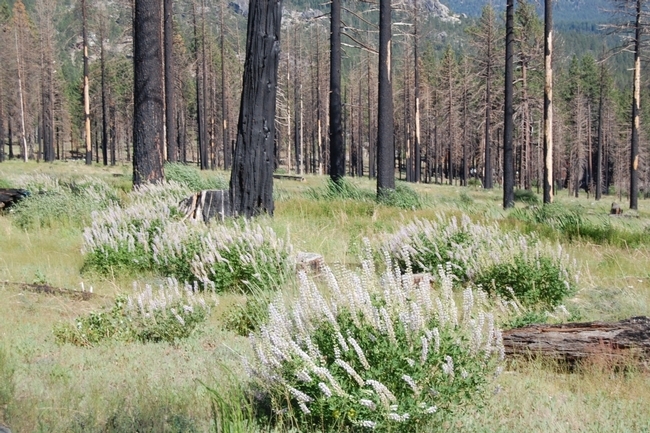 Building on the Sheep Fire helps Sequoia NF to increase the scale of prescribed fires. Small fires are fine if only there were enough of them, but funding and air quality – among other issues – limit the opportunity and the window when burns can occur. North et al. (2012) calculated that less than 20 percent of the forestland in the Sierra Nevada is receiving the fuels treatments (either through fire or mechanical treatment) needed to create and maintain historic fuel structures in the forest. [v] With the typical small scale project, there is simply not enough funding to do the necessary work. Cost is one hurdle solved by increasing the scale of the project. “As the size of the acreage grows in the project the cost per acre drops significantly,” Leusch said. 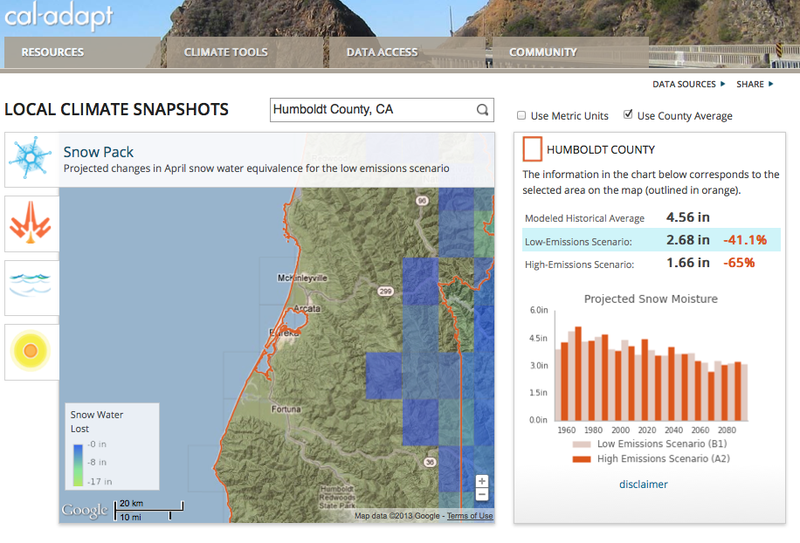 But even as costs per acre drop, air quality remains a concern. Smoke plumes from fires in the Sierra Nevada can hang around local towns and drift down into larger cities in the Central Valley, increasing the amount of particulate matter and ozone to unhealthy levels and creating haze that reduces visibility. The Rim Fire – which was an unmanaged wildfire – this summer near and in Yosemite National Park created unhealthy air quality conditions in towns as far away as Reno, NV, over 100 miles away. 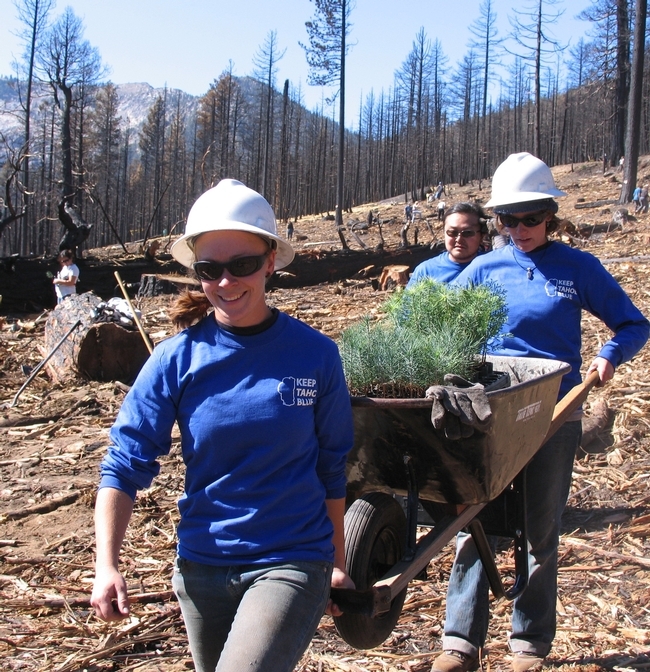 During the two and a half years of the planning stages coordination and collaboration with partners like the San Joaquin Valley Air Pollution Control District, but also with non-profits like the Sierra Forest Legacy, became essential to the success of the project. “It was definitely a collaborative effort,” Leusch says. But the relationship does not end at the planning stage. For Trent Proctor, air quality program manager for the Pacific Southwest Region of the USDA Forest Service, communication and coordination with the air board, and monitoring of smoke emissions from the fire, are vital to the success of prescribed fires. The California Air Resources Board limits the days when burns can occur to days when air quality is already good and the weather helps move the smoke away from communities. Prescribed fires ignited in the fall and spring can take advantage of weather patterns that allow the smoke to disperse. The season of the burn and the fuel moisture are two components that help determine the windows when burns can occur. The fuel moisture, along with the outside temperature and humidity, helps determine how hot the fire will burn. “There is a window in fall we have to hit,” Proctor says. The burn window is limited by high ozone levels in the summer and high amounts of particulate matter from residential stoves in the winter. In addition, more moisture in the winter increases fuel moisture to the point where the fire may not spread like they want. Managers want fuel moistures low enough that there will be sufficient combustion, but high enough so that the fire will not escape control. The burn had been planned for earlier October of this year, but the federal government shutdown limited the burn window and they had to reschedule to fall 2014. Leusch and others plan to have a smaller 500-acre spring burn in another unit that will help to achieve resource goals. [i] California Department of Forestry and Fire Protection (CDFFP). 2012. Fire Perimeters Version 12_1. GIS Database, downloaded from: http://frap.fire.ca.gov/data/frapgisdata-sw-fireperimeters_download.php. [ii] North, M., Collins, B., Stephens, S. 2012. Using Fire to Increase the Scale, Benefits, and Future Maintenance of Fuels Treatments. Journal of Forestry 110(7):392-401. [iii] North, Malcolm, ed. 2012. Managing Sierra Nevada forests. Gen. Tech. Rep. PSW-GTR-237. Albany, CA: U.S. Department of Agriculture, Forest Service, Pacific Southwest Research Station. 184 p.
[iv] North, M., Collins, B., Stephens, S. 2012. Using Fire to Increase the Scale, Benefits, and Future Maintenance of Fuels Treatments. Journal of Forestry 110(7):392-401. [vi] Collins, B. and Skinner, C. 2013. Fire and Fuels. Chapter 4.1 in Science synthesis to promote resilience of social-ecological systems in the Sierra Nevada and southern Cascades. USDA Forest Service Pacific Southwest Research Station. [vii] North, M. 2013. Forest Ecology. Chapter 2 in Science synthesis to promote resilience of social-ecological systems in the Sierra Nevada and southern Cascades. USDA Forest Service Pacific Southwest Research Station. This blog post is written by Justine Reynolds, Program and Community Outreach Coordinator for the San Joaquin Valley Leadership Forum. All pictures are attributable to Pam Flick , California Representative at Defenders of Wildlife - thanks Justine and Pam! Ramiro explained what tree species were present: white fir, incense cedar, lodgepole pine, sugar pine, jeffrey pine, and black oak. He also explained how to identify each species. He went over the marking guidelines, how they are used, and the scientific basis for the marking guidelines. Carolyn Ballard, District Fuels Officer, added information about fire on this landscape. Lot of interest in mistletoe and its related opportunistic fungus, species specific mistletoe. Chipping and biomass question; how much is left and how much is chipped? Ramiro discussed how campgrounds are treated differently. Trees are treated to prevent root rot. Consideration has to be made for structures, and keeping areas open. Minimizing disturbance. Stream nearby also requires riparian corridor considerations. Ramiro explained how the timber was cut, based on what guidelines.Indicated the difference between treated and untreated areas. Pointed out areas where heterogeneity has been maintained. Carolyn Ballard discussed how the brush pile would be dealt with. Some discussion of how contracts are put together and how timber is sold. Benefits of leaving logs. Is there a problem with methane production?No not rotting. Open-ness affecting wildlife species? Also provides opportunities for foraging. What is the time period between treatments? When was this site last treated with fire? What is a hazard? Closeness to the road, slope is a factor, has to have damage potential. This unit has a lot of south facing slope, dictates level of harvesting is performed. There was a brief discussion of marking guidelines. Specific to help marking crews understand fisher habitat needs. Marked fisher sites include ones identified by PSW as active/used sites, as well as ones marked by FS crews. PSW checks FS marked areas afterwards for fisher activity. What is a rest site used for? Way back in the spring of 2012 the CFSC hosted Rick Sneeuwjagt, the recently retired State manager of Fire Management Services of the Western Australia Department of Environment and Conservation (DEC), on a "fire science and management tour" of California. We went to a fire and smoke workshop in the southern Sierras and a meeting of the Northern California Prescribed Fire Council, visited field sites, and met with a variety of other managers, administrators, and researchers along the way. Rick inspired jealousy among many Californian managers, researchers, and regulators, because the DEC is the land management, research, and regulatory agency that manages and studies fires and smoke throughout the the state of Western Australia. It's the only public land management agency in the state. Compare that to California's multiple state and federal land management agencies and regulatory agencies, which can make a managing fires and smoke (which don't recognize bureaucratic boundaries, as we know) difficult. On top of the bureaucratic advantages of the DEC, that agency has run an impressively large-scale prescribed fire program for 50 years. The program burns an average of 2.5 million hectares each year, which comes out to 6% to 8% of the DEC's forested landscape. Much of this burning is planned to mitigate the risk of wildfires - large burn units averaging over 2000 hectares / 4800 acres (much larger than prescribed burns here in CA) are pre-planned multiple years in advance to maximize fire protection and ecological benefits. That's a lot of burning by any standards, but just as impressive is the amount of collaboration with researchers. The DEC managers and scientists work closely to study and improve the outcomes of their burns. One example: by burning in such large units, they've found that they not only reduce costs per acre but also create a highly beneficial mosaic of fire severities, fuel ages, and habitat types. The findings of DEC fire research are translated into public announcements to improve the understanding of fire use as well as to help convince politicians of the need for prescribed fires to prevent wildfires in Western Australia's seasonally dry, mediterranean climate. We learned a lot from Rick's visit, and wrote up a report that's featured in the Forum section of August 2013 issue of Fire Ecology. We tried to focus on making constructive suggestions for fire management and policy in California, based on the successes and challenges seen by the DEC in Western Australia. We looked at six different areas: 1) novel man- agement practices, 2) inter-agency collaboration, 3) regulatory collaboration and policy, 4) research integration, 5) cultural acceptance, and 6) political support of prescribed fire. Read the comparison here, and let us know if you have any responses through email or Twitter @CaFireScience. * This is a re-posted blog entry from the UCANR Green Blog. Ask most youth what they think about wildfires in forests and they will usually respond with "they kill trees and animals" or "it’s bad – they burn down homes and put out lots of smoke." They are partially right. 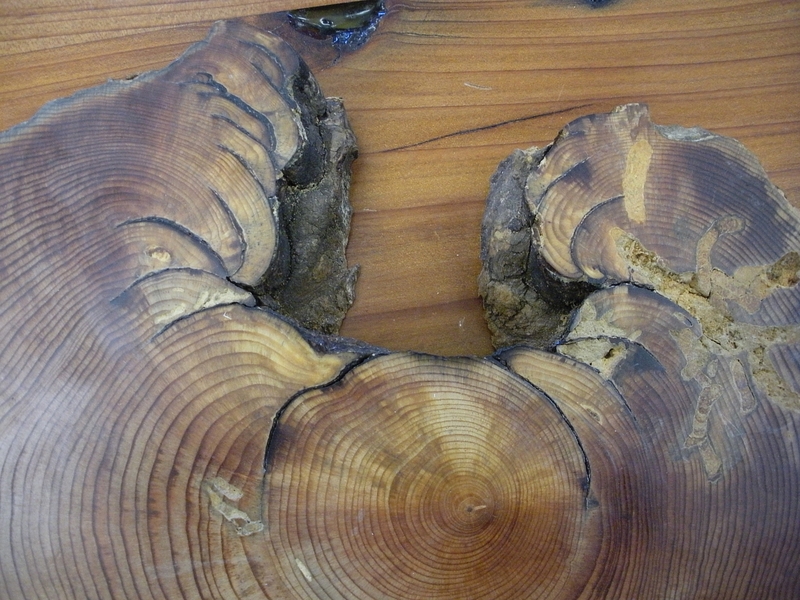 Ask youth about considering a career studying the history of fire from a tree cookie, a slice of tree branch that shows the rings, or lake bed sedimentation. Or ask them what role wind plays in how a fire jumps from treetop to treetop or how wildfire can help open pine cones and produce a huge flower show. Then they might respond with, "No way, is that a real job?" Two eighth-grade students at Sutter Middle School in Sacramento got a chance to learn about fire ecology careers through a project in their science class requiring researching science careers. Students Maura Ingram and Jordan Johnston decided to explore fire ecology and learned that fire is a hot career choice. Maura and Jordan interviewed Scott Stephens, professor in the Department of Environmental Science, Policy and Management at UC Berkeley*, about fire ecology careers. They learned that fire ecology as a discipline focuses on the origins of wildland fire and its relationship to the environment, both living and non-living. Fire ecologists recognize that fire is a natural and important process in the forested ecosystem, one that both animals and plants depend on. “Some fire ecologists will be fire managers working with the U.S. Forest Service, National Park Service or private companies and will ignite and manage prescribed fires and manage wildfires,” Stephens said. “Other fire ecologists with jobs like mine will do research and write papers as teachers and university faculty. That will help guide fire managers in their work. More people are getting interested in fire ecology and the field has really grown in the last 15 years." 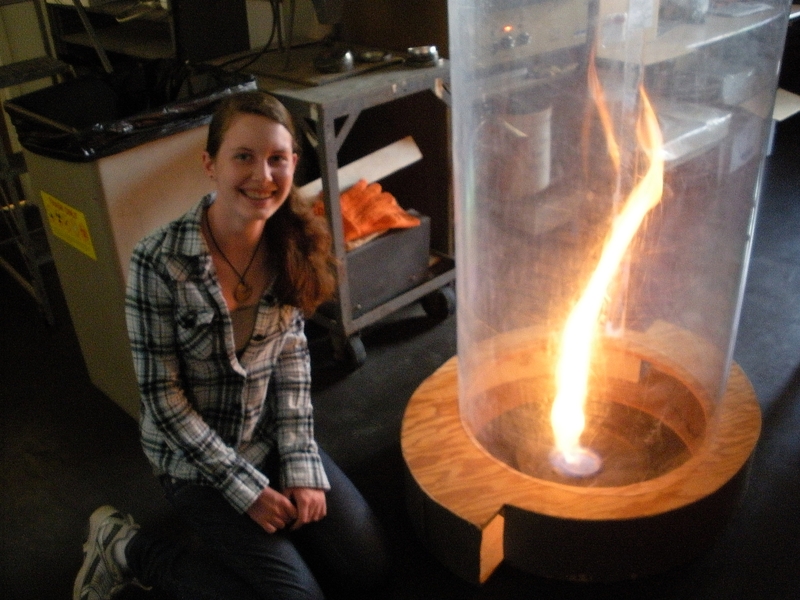 Anu Kramer and Kate Wilkin, UC Berkeley graduate students in the Stephens Fire Lab, showed Maura some of the tools they use in fire ecology research, such as lidar, computer fire models and the fire vortex used to demonstrate fire physics and extreme fire behavior. UC Berkeley students and researchers are working to understand how warming and precipitation changes due to climate change will affect fire frequency and behavior, and how fire disturbances affect plants by conducting scientific research and providing training in the fields of wildland fire science, ecology, and resource management. Students and researchers participate in interdisciplinary efforts when possible and share findings by publishing results in peer reviewed academic journals, posters for academic conferences, and conducting outreach to schools. Berkeley provides high quality scientific training and guidance for graduate students that will prepare them for careers in academia or professional fire science, policy or management. “When you think about fire-related careers, most kids think that firefighters are the only ones that deal with fire directly,” said Maura. “But the career opportunities are endless. I have learned a lot about how important fire is. Fires can still cause a lot of damage to the forest and homes, but studying fire ecology is helpful because we can then use the data to apply fire in a more beneficial way – ways that help the forest, wildlife and the overall environment." Stephens is one of the principle investigators of the Sierra Nevada Adaptive Management Project (SNAMP). SNAMP is investigating how fuels thinning projects effects fire behavior and forest health, water quality and quantity, and wildlife. If you think that the California Fire Science Consortium should make some similar videos, let us know what topics you think would make good videos. We've been currently focusing on written briefs/syntheses, webinars and in-person events instead of videos (in part because these are cheaper for us to make a lot of...), but videos could be an option in the future. The two sites above are great examples of the usefullness of short videos. The first cake, shown above, represents a dense Sierra mixed-conifer forest. Large sugar cones with green rice crispies are large remnant pines. The smaller cones with green shredded coconut represent invading shade-tolerant fir trees. Slivered almonds represent a heavy buildup of surface fuels. To represent immediate post-high-severity fire effects, Anu employed a highly accurate rendering of stand conditions using a dense, flourless chocolate cake. A passionfruit cake with chocolate-coconut frosting was used to demonstrate one year post-wildfire regeneration. Note the vibrant understory regeneration with wildflowers. How's that for effective science communication? Pretty darn good, I'd say. Big thanks to Anu for the cakes! Photo credits to Anu Kramer and Lauren Hallett. This entry is written by Lenya Quinn-Davidson, the director of the Northern California Prescribed Fire Council and the coordinator of the consortium's northern California region. Well, we’ve done it again! One week ago, the Northern California Prescribed Fire Council held another successful meeting, this time in the Tahoe Basin. Like the spring meeting in Chico, we had over 100 people in attendance, and as usual, it was a diverse group. We had local folks from Tahoe there, in addition to fire managers, residents, government officials, researchers, and others from across northern California. We also had people come from as far away as Florida, Mississippi, Utah, and Washington, and we had a few participants from southern California. It was a great crowd! On the evening of Wednesday, November 7, the council’s Steering Committee had their annual strategy meeting. The committee welcomed three new members: Eamon Engber, Fire Ecologist at Redwood National Park; Tom Garcia, Fire Management Officer at Whiskeytown National Recreation Area; and Jeff Kane, Professor of fire science Humboldt State University. The committee also named Lenya Quinn-Davidson, the long-time coordinator of the council, as the Council Director. These changes will help provide stability and leadership to the council as we begin transitioning to a new Chairperson. Morgan Varner, our current Chair and one of the co-founders of the council, has taken a faculty position at Mississippi State University, and he will be leaving the Chair position next spring. During the meeting, the committee also discussed upcoming projects and goals of the council, and worked on a strategic planning document, which should be ready for distribution at the spring meeting. On Thursday, November 8, we met at the Embassy Suites in South Lake Tahoe for a full- day conference. Speakers included Joe Millar, the Director of Fire and Aviation for Region 5 of the Forest Service, as well as Norb Szczurek, Division Chief for the North Lake Tahoe Fire Protection District, and several top fire scientists, including the Forest Service’s Hugh Safford, Scott Stephens of UC Berkeley, and Jeff Kane of HSU. In the afternoon, we had workshops by Sonoma Technology, Inc., the Fire and Environmental Research Applications (FERA) team out of Seattle, and Miriam Morrill of the US Fish and Wildlife Service. We capped off the evening with a mixer at the hotel, dinner out at local breweries and restaurants, and the premiere of a new documentary on prescribed fire, put together by Will Harling and Stormy Staats of the Mid Klamath Watershed Council in Orleans, CA. The documentary will be available on DVD soon, and will be a great resource for the northern California prescribed fire community. It will also be featured at AFE’s International Fire Congress in Portland next month, but we got to see it first! Start thinking about whether you can organize a viewing in your hometown. This unit is located below expensive homes in Incine Village and was treated with an understory burn in 2011. Photo: Susie Kocher.On Friday, brave meeting participants set out into the fresh snow to see how prescribed fire is used in the Tahoe Basin. First we visited two Forest Service burn units on the eastside of the lake. John Washington and Kyle Jacobsen, both fire managers with the USFS, led the group in a discussion of the challenges and opportunities present in the area. The group spent the second half of the day with Norb Szczurek and Forest Schafer of the North Lake Tahoe Fire Protection District in Incline Village. They toured the impressive NLTFPD facilities, rode in the district’s crew buses, and took an inspiring walk through some of the units that Norb and his crew treat with prescribed fire. Many of those units are on steep, shrubby terrain below million dollar homes, but the NLTFPD has been successfully treating those areas for years with the support and trust of the local community. Needless to say, field tour participants were greatly impressed and inspired by the work of this municipal fire department. We are planning our spring meeting for sometime in April in Mendocino County. We will be in touch early next year with more details. Please contact Lenya at nwcapfc@gmail.com if you have questions or ideas, or if you want to join our mailing list. We look forward to seeing you then! As most fire managers in California already know, getting mediaattention for fire and fuel treatments can be a challenge in our already saturated media markets. And if just getting coverage isn't hard enough already, working to make sure that your treatment - be it a prescribed fire, thin, or managed wildfire - is accurately presented presents another hurdle. The below guide from The Nature Conservancy's Fire Learning Network details a list of best practices for not only garnering media coverage in the first place, but also for prepping your team's message so that the resulting story gets your key points across to the public. While this guide is specific to a training event for fire staff, much of the same practices could be applied to any fire-related event. You can download TNC's PDF of this guide here. Many thanks to TNC for letting us share this! The Nature Conservancy, Fire Learning Network and Santa Fe National Forest hosted an International Prescribed Fire Training event in northern New Mexico. The fire training brought Spanish-speaking and bilingual forest experts together from Argentina, Puerto Rico, Mexico and the U.S. to share and learn about prescribed burns, fire management and conservation practices to take back to their home landscapes. They implemented several prescribed burns, in addition to orientations and presentations. The fire exchange programs began in 2008 to help address the nation’s shortfall of qualified burners. Media staff working with event organizers secured eight placements from local newspapers and national outlets, ranging from E&E Greenwire and NY Times online to Univision and local radio and newspapers (see box for links). Opportunity: Leader Jeremy Bailey clearly stated that media was important to the event and that he would take measures to ensure journalists could get on the ground and close to the action, and that fire experts would be prepped for interviews. Jeremy also communicated the importance of 24 hours’ notice being needed to ensure the best possible story and the safety of all involved. Challenge: The event would be taking place over the course of two weeks, an hour-and-a-half to two hours from the metro media market, and in an area with spotty cell service. Gather assets such as photos and video that can be shared with media. For example, I solicited head/field shots of Jeremy in case he was booked for a TV phone interview, since the Albuquerque metro area media market was two hours away. Contact partners early to discuss media strategy/roles/deadlines. The Conservancy took the lead on this project. We agreed I would keep Forest Service in the loop when we secured interest. Write a media release and vet it through partners. Build a local targeted media list. Because fire experts were Spanish- speaking or bilingual we reached out to Spanish-language media. Meet/communicate with other media teams in the organization to discuss regional/national outreach ideas and determine roles. In this case, I was going to reach out to the NY Times and E&E while the national office con- tacted Univision. Email pitches/release with photos. I included a note that the training leaders needed 24 hours’ notice to ensure the best possible story and safety. Follow-up phone calls: be persistent, take notes and schedule return calls. Mary and I tracked media hits and shared stories with key team players/ partners/leadership. It was exciting to share the tremendous work on the ground through the creative media stories. In an effort to extend our reach, some of the story links were posted on Facebook sites (e.g. FLN and NM and national Conservancy sites). Keep calling reporters until you connect live and in person. I was determined to get Univision to cover this story. I called four times before connecting live with a reporter. If you haven’t developed a relationship with a reporter inside a media shop, you may have to try a couple different ones (one at a time). One reporter may not get jazzed with your story, but his neighbor loves it. If I reach out to a second reporter in the same shop, I always mention I tried to connect with the other person but didn’t have success (full disclosure). I had success with Univision and KOAT (ABC) with this tactic. Logistics were challenging. Fire experts were working long days in the woods where there was little or no cell service. In most cases, connections with media needed to be made early in the morning or in the evening. We realized this very early in the game. Mary Huffman stepped up to be our on- the-ground media coordinator. She responded as quickly as she could. She was thorough and ensured our media partners had everything they needed. The role Mary filled was critical to our success. It has been four years since the summer of 2008, when lightning strikes in late June ignited fires throughout California. During that fire season, over 1.3 million acres burned throughout the state; smoke filled our valleys for several months, and many of us saw the flames up close as we traveled from one region to another. We're all reminded of that summer every time we drive through the mountains of Northern California, or when we crack open a smoky bottle of 2008 wine. For me, the 2008 fires were meaningful in a number of ways. I grew up in Hayfork, in the heart of Trinity County, where big fire years punctuated my childhood. I was 5 years old in 1987, when wildfires burned 54,000 acres, or 19%, of forests on the Hayfork Ranger District. I was 10 years old in 1992, when the Barker Fire almost burned down my best friend's house. And I was getting ready for my last year of high school in 1999, when the Lowden Fire--an escaped prescribed burn--devastated much of the nearby town of Lewiston. As luck would have it, 2008 was another important year for me: in June, I was preparing to head to Hayfork for the summer to start my master's research, which (coincidentally!) was focused on community support for prescribed fire. Smoke from the 2008 wildfires in Hayfork, CA. I hadn't planned my research to coincide with the biggest fire year in recent history; in fact, I was quite concerned that it would skew my results. Interviewing people about prescribed fire while they're choking on smoke probably isn't the best way to get an unbiased response. I thought the smoke, the fire crews, and the blackened hillsides would spark people's memories of the Lowden Fire, and their support for prescribed fire would, therefore, seem unusually grim. Indeed, the wildfires did take center stage in my interviews--people wanted to talk about fire suppression tactics and costs, and I had to figure out a way to address my research questions in concert with those timely topics. However, the main themes that emerged in my interviews were not negative; in fact, people were surprisingly focused on the natural role of fire in the ecosystem, and they consistently framed negative remarks about the wildfires in the context of what they perceived to be the real problem: poor forest health and a lack of resilience resulting from a century of fire suppression. Though the attitudes I encountered in Hayfork were not what I expected at the time--especially given the 220,000 acres that burned in the Shasta-Trinity National Forest that year--I've come to see them as a signal of larger shifts in the way that people perceive and understand fire. These changes are occurring in the public sphere, as I observed in Hayfork, but they are also pronounced in the scientific and management communities, where there is increasing attention not only to fire science and ecology, but also to communication and collaboration. Prescribed fire in the Bald Hills of Redwood National Park. The Park uses prescribed fire to maintain its oak woodlands and prairies and ward off encroachment by Douglas-fir. In California, there are two major efforts that speak to this changing culture and attitude in fire: the Northern California Prescribed Fire Council and the California Fire Science Consortium. Both of these groups are collaborative, involving a diverse array of organizations, agencies, and individuals, and both are focused on cultivating new knowledge, capacity, and cooperation within the state's fire community. I've had the honor to be involved in both of these groups--as the Coordinator of the Prescribed Fire Council since its inception in 2009 and more recently, as the primary staff person for the Northern California region of the Consortium--and I'm excited to use this space to share some of the resources and opportunities offered by these two groups. In their own ways, the Council and the Consortium are paving the way for a more fluid, grounded, participatory approach to fire in our region. In 2009, a small group of fire scientists and managers joined forces and spearheaded the Northwestern California Prescribed Fire Council. The Council joined over 20 other state and regional councils across the country, all working on issues and impediments associated with the responsible, effective use of prescribed fire. At that time, the Council was focused only on the northwestern corner of the state: west of Interstate 5 and north of highway 20. However, after the second meeting of the Council--where the audience included a number of interested folks from the northeastern and central parts of the state--Council participants agreed to expand the range of the nascent organization and change the name to the Northern California Prescribed Fire Council. The Council developed a set of by-laws, established a Steering Committee (including representatives from federal and state agencies, non-governmental organizations, tribes, academia, and more), named me the Council Coordinator, and chose Dr. Morgan Varner--a fire science professor at Humboldt State University and the visionary behind the effort--as the Council Chair. Nick Goulette, the Executive Director of the Watershed Research and Training Center in Hayfork and the Vice Chair of the Council, also stepped forward to provide administrative and financial support to the Council through the California Klamath-Siskiyou Fire Learning Network. The mission of the Council is to provide a venue for the prescribed (Rx) fire community to work collaboratively to promote, protect, conserve, and expand the responsible use of Rx fire in Northern California's fire-adapted landscapes. The Council holds two public meetings a year, inviting a wide range of prescribed fire experts to share new information about the art, ecology, science, and culture surrounding prescribed fire. 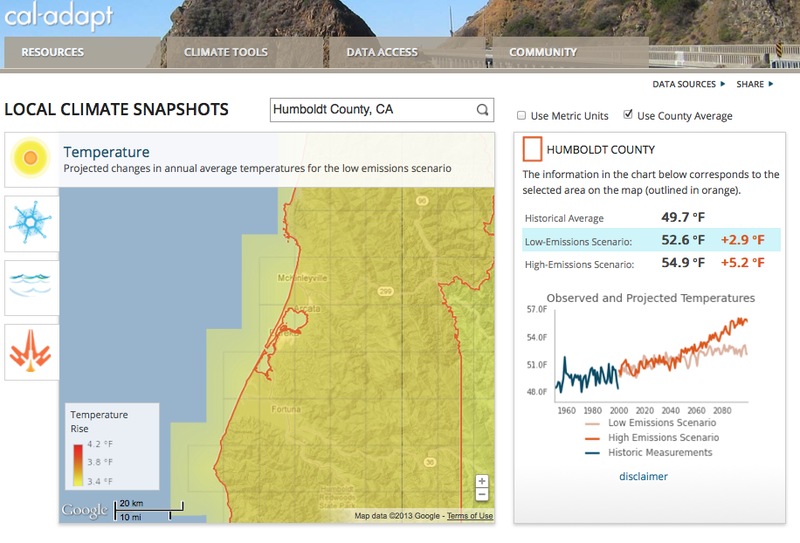 In order to maximize attendance, Council meetings are planned in a different location each time; they have taken place in Redding, Arcata, Berkeley, and Chico, and have included field tours of burn units in Whiskeytown National Recreation Area, Redwood National Park, the East Bay Municipal Park District, Big Chico Creek Ecological Reserve, Bidwell Park, and the Sacramento River National Wildlife Refuge. The next meeting will be held in Tahoe in early November. In addition to the meetings, the Council is working on a number of projects. This summer, a sub-committee is working on a strategic communications plan for the Council. This plan will outline the Council's long-term communications and outreach goals, including unified messaging with other agencies and organizations and the dissemination of pertinent, accurate information about Rx fire. The Council is also working with the Fire Learning Network to plan an Rx Fire Training Exchange for the fall of 2013. The two-week event will take place throughout Northwestern California, and will include training burns on a range of landownerships. For more information on the fall meeting in Tahoe or on the other efforts of the Council, please contact me at nwcapfc@gmail.com or visit the Council's website at www.norcalrxfirecouncil.org. Every year, significant resources are devoted to fire research and management, and the collective understanding of and relationship to fire is evolving with new scientific findings and adaptive management strategies. However, the interpretation and application of science remains a challenge, and fire scientists and managers often find themselves in separate spheres, with limited opportunities for shared learning and knowledge exchange. The Joint Fire Science Program--a multi-agency program that funds wildland fire research--has recognized this issue, and fire science delivery has become one of its core objectives. Throughout the United States, the program has funded fire science delivery consortia: collaborative groups of fire scientists and outreach specialists who work together to improve the understanding and application of fire science. The California Fire Science Consortium, which is entering its second year, is a statewide organization with 5 regional teams; the Northern California region is based out of the Humboldt County office of UC Cooperative Extension, where I work with Yana Valachovic, the Forest Advisor, to develop materials and activities specific to our region. The Consortium website has an "Ask a Scientist" form, where people can submit questions and have them answered by fire scientists; it also has links to webinars on a variety of topics and a wide range of research briefs on important fire science papers. Recent briefs have covered trends in fire severity, the influence of sudden oak death on fuels and fire behavior, fuelbed changes due to conifer encroachment in oak woodlands, and much more. These resources are all available to the public, and the Consortium is also open to suggestions, if landowners, managers, or other interested folks have ideas or specific issues they'd like to see addressed. For more information, or to sign up for the mailing list, please visit the Consortium website at http://www.cafiresci.org or email me at lquinndavidson@ucdavis.edu. It's an exciting time to be part of the fire community in Northern California; whether you're a fire management officer with a federal agency, a non-profit employee who wants to use fire as part of a restoration plan, or a landowner who wants to learn more about fire science, there are new doors opening every day. The Council and the Consortium are just two examples of recent innovative approaches to fire; other national and local programs, like the Fire Learning Network and the projects of the Mid Klamath Watershed Council and the Watershed Research and Training Center, are also pioneering new strategies and partnerships for reintroducing fire and increasing the resilience of our region's forests and woodlands. 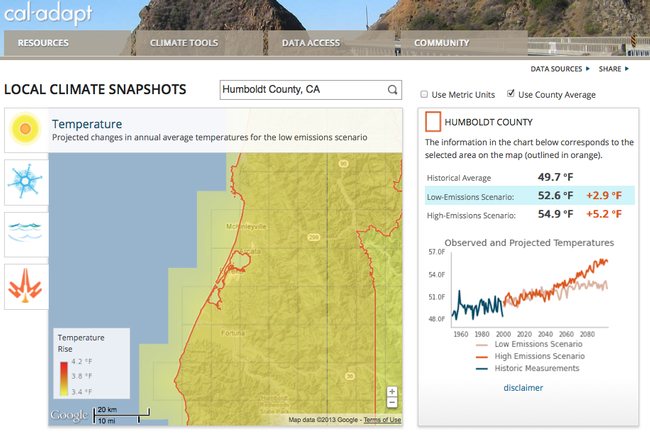 In many ways, I think we've transcended the Smokey the Bear era, and we--the public, the scientists, and the managers--are ready to approach fire from a more nuanced, collaborative angle that will allow us to adapt to changing social, political, and physical climates. If you aren't involved already, now is the time; attend the Prescribed Fire Council meeting this fall, submit ideas and questions to the Consortium, or get involved with your local fire managers, because the future of this region is a future with fire. Lenya Quinn-Davidson is a Staff Research Associate with University of California Cooperative Extension in Humboldt County. She is also the Administrative Coordinator of the Northern California Prescribed Fire Council, and she serves on the Board of the Trees Foundation. Lenya was raised in Hayfork, in the heart of Trinity County. She received her bachelor's degree from UC Berkeley in 2004, and completed her master's at Humboldt State University, where she did research on impediments to prescribed fire in northern California. She can be reached at lquinndavidson@ucdavis.edu or (707) 445-7351. Despite the interest in heterogeneous fuel and fire treatments in California (See GTRs 220 and 237), there are few on-the-ground examples of finished treatments for managers to visit and learn from. On August 24th, 2012 Erick Knapp (USFS PSW) and Maria Benech (USFS Stanislaus NF) led a CFSC-organized field trip to the Stanislaus-Tuolumne Experimental Forest (STEF), where their crews have finished thinning treatments on one of the largest variable-density thinning projects currently underway in the state. 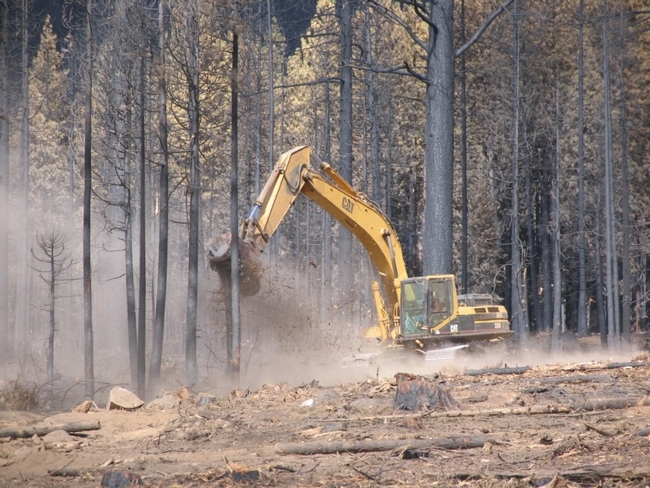 The different treatments (variable thin-no burn, variable thin-burn, control) are part of a study intended to investigate the ecological effects of structural variability through forest thinning and burning operations. The group stops to discuss in a gap - note the large legacy trees in the foreground opening, with denser groups of smaller trees in the background.One of the main goals of the project is to try to recreate a similar variable stand structure to what was found in the central Sierras prior to fire suppression and logging. In 1929 an inventory was taken of the same STEF lands for a “methods of cutting study”. Then, much of the forest area exhibited distinct gaps and patches of trees - separate groups of trees each with similar density, basal area, and canopy cover, along with gaps of understory vegetation with little to no trees mixed in to the overall stand. The August field trip visited four different areas within the experimental forest. At each stop the group walked through different treatments and controls to discuss topics ranging from operational considerations to wildlife habitat. The variability within each treatment was obvious – there would be open patches with one to three large trees and snags next to dense groups of small firs and cedars. The thinned stands also provided a stark contrast to the untreated control stands, which were generally were dense with shade-tolerant understory trees and ladder fuels throughout, in addition to the larger legacy trees common throughout the STEF. The high-variability treatment prescription evolved over 3 years after much discussion and planning with staff and stakeholders. Working with all the marking crews at once to mark sample treatments, before each crew went off to work individually, helped create a shared baseline of how to mark the treatments. Additionally, the marking crews included an assemblage of wildlife biologists, botanists, fuels specialists, silviculturalists, and planners. Most of the treatments used a leave-tree marking guideline, while cut-tree guidelines were used in some of the old-growth stands. Knapp discussing marking protocols in an untreated control unit.Knapp and Benech emphasized that the marking guidelines are flexible – “this means few black and white decisions and no right or wrong answers, which was initially frustrating for some.” Often, certain stand characteristics such as remnant black oaks, root disease pockets, or legacy trees would be used as “anchors” to plan around. This fluid approach draws a contrast to the standardized thin-from-below treatments commonly used in traditional thinning projects. While more time-consuming at first, as the crews become more experienced at marking these complex treatments the rate of marking progress grew closer to the rate for more traditional treatments. Creating suitable wildlife habitat and refugia was a factor that helped guide the creation of patch and gap sizes and distributions. This was evident during the field tour: treated stands showed a variety of large-diameter and course woody debris on the forest floor as well as a spectrum of different tree sizes and crown densities. As such the treatments were designed to provide cover and habitat to a wide range of wildlife, and to avoid single-species management practices. The concept of this design is “not to manage every slice of pie for every species,” said Eric Knapp during the tour. Outreach to stakeholders was key to successfully implementing these treatments, particularly in regard to the lack of diameter limits on tree removal in the experimental forest. Throughout the planning process, meetings and field visits were held with stakeholders to help build trust and accountability. Showing a comparison of current density, tree arrangement, and understory vegetation to the 1929 stem maps of the forest helped to visualize and contextualize planned treatments. Prescribed burns of some of the treated stands at the STEF are scheduled for this fall. Hopefully we’ll be able to plan another field visit afterwards or in the spring, so stay tuned. Open tree crowns and retained snags in a treated unit. A retained snag, in the center of the photo behind the group, shows large woodpecker holes. 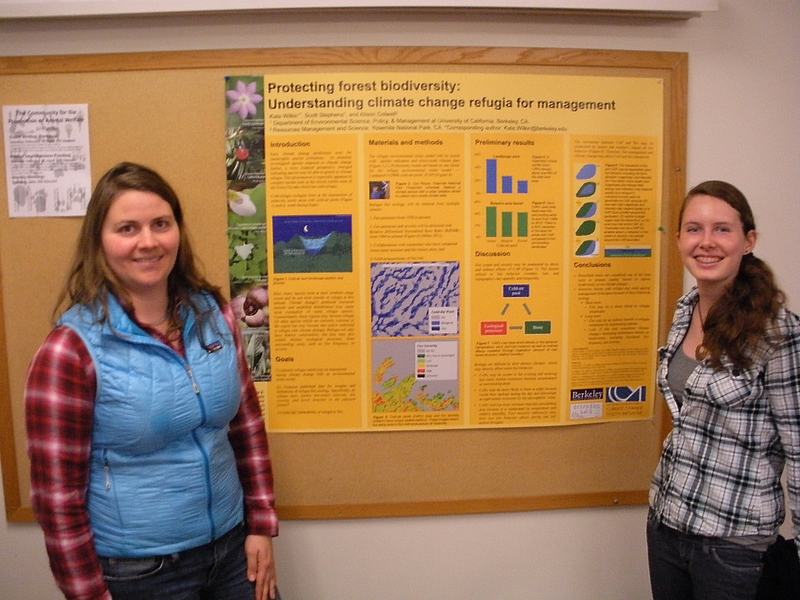 This entry is a re-posting from the UC ANR Forest Research and Outreach blog. 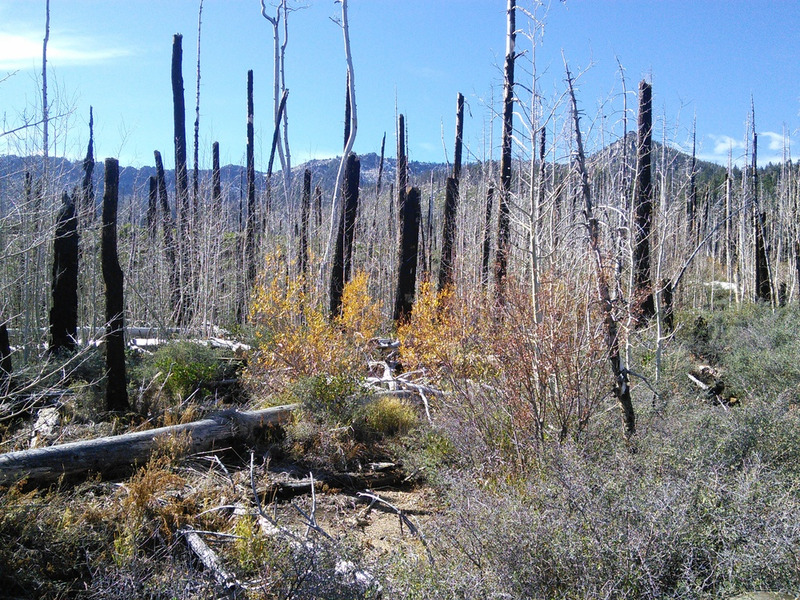 100 percent tree mortality caused by the Angora fire, August 2007. In the many forested areas where wildfires are currently burning, the question will soon arise: What should be done after the fire goes out? That depends on the severity of the burn and land owner goals. For high severity burns where very few or no live trees remain to provide seed for the next generation, forest recovery can take a very long time. Typically forest landowners want to restore their lands to a forested condition as quickly as possible. In that case, an active approach can help them reach their goal sooner. The California Tahoe Conservancy has just released a report on the outcomes of active restoration of 40 acres of Conservancy lands where all trees were killed by the 2007 Angora fire in South Lake Tahoe. That fire burned 3,100 forested acres as well as 250 homes. 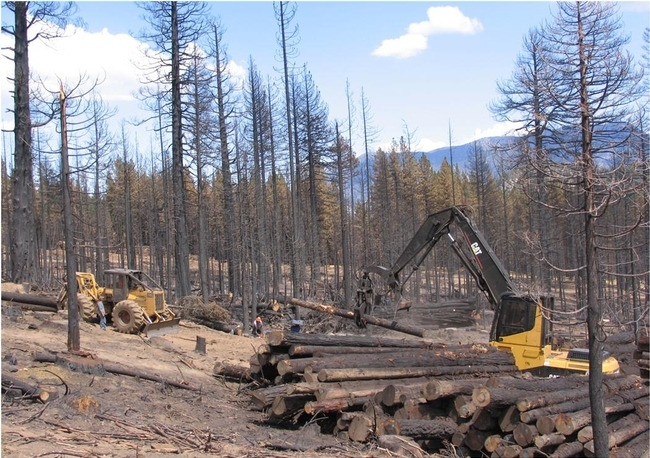 Fire-killed trees were skidded to a landing and taken to a lumber mill, September 2007. Post-fire Conservancy goals were to re-establish a native forest, reduce hazards posed by dead trees, and avoid water quality impacts. Contractors cut large dead trees, skidded them to a landing, loaded them on a log truck and sent to a nearby mill. Some large dead trees were left on site to provide wildlife habitat. Small trees were ground up (masticated) and left on site to control erosion and suppress competing vegetation. Then one- to two-year-old native conifer seedlings were planted. The report's authors estimate this active approach has hastened the return to a forested condition in the area by about 60 years. This is because planted seedlings are growing quickly while there are few naturally sprouting tree seedlings in adjacent untreated areas and these face competition from vigorously growing native brush that was stimulated by the wildfire. Soil monitoring showed no compaction by heavy equipment during tree removal and minimal soil erosion. Woody mulch left on site was also effective at suppressing brush to give newly planted tree seedlings a competitive edge. Landowners looking for guidance on post-fire forest management are encouraged to download the free UC Cooperative Extension publication “Recovering from Wildfire: A Guide for California Landowners” and consult the UC Center for Forest Research and Outreach website at http://ucanr.edu/forestry. Small trees being masticated to provide erosion control and brush suppression. Replanting Conservancy land after dead tree removal, September 2007. 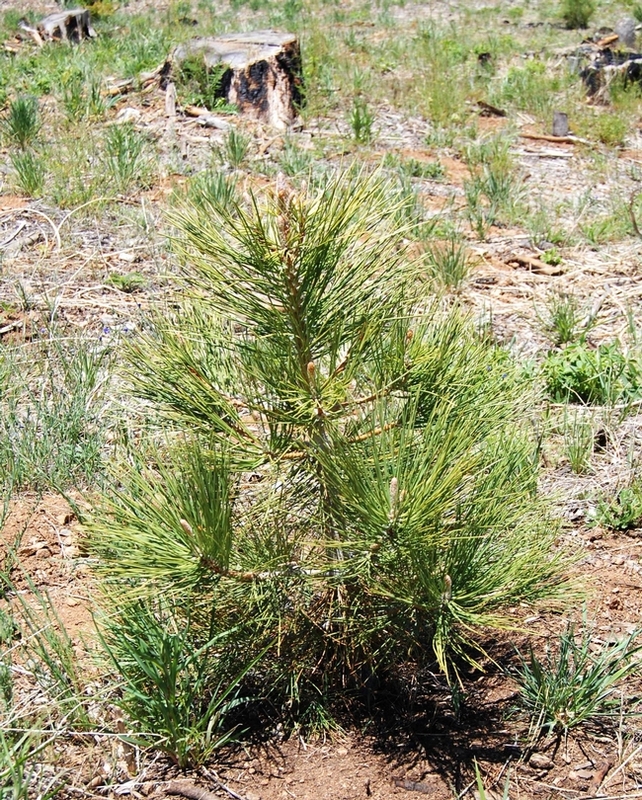 Jeffrey pine seedling planted after the Angora fire in 2007. In an interesting follow-up to our last blog entry, we now have an example of a major media outlet connecting the current mega fires in the West not only to climate change but also to the century-long history of fire suppression in the West. M Sanjayan, the lead reporter on the story, is also a lead scientist with The Nature Conservancy. It would be great to see more similar collaborations between scientists and the media - much can get lost in translation, and shortening the chain of information to the general public certainly couldn't hurt. This blog is a re-post from the Media Matters research page. Read the entire post here, which includes individual responses from fire scientists (some from the CFSC) on the connections between climate change and wildfire. While numerous factors determine the frequency, severity and cost of wildfires, scientific research indicates that human-induced climate change increases fire risks in parts of the Western U.S. by promoting warmer and drier conditions. Seven of nine fire experts contacted by Media Matters agreed journalists should explain the relationship between climate change and wildfires. But an analysis of recent coverage suggests mainstream media outlets are not up to the task -- only 3 percent of news reports on wildfires in the West mentioned climate change. Only 3 Percent Of Wildfire Coverage Mentioned Long-Term Climate Change Or Global Warming. The major television and print outlets largely ignored climate change in their coverage of wildfires in Colorado, New Mexico and other Western states. All together, only 3 percent of the reports mentioned climate change, including 1.6 percent of television segments and 6 percent of text articles. METHODOLOGY: We searched Nexis and Factiva databases for articles and segments on (wildfire or wild fire or forest fire) between April 1, 2012, and June 30, 2012. News outlets included in this study are ABC, CBS, NBC, CNN, The New York Times, The Washington Post, The Associated Press, The Los Angeles Times, CNN.com, USA Today and The Wall Street Journal. MSNBC and Fox News were not included in this analysis because transcripts of their daytime coverage are not available in the Nexis database. Evidence Suggests Climate Change Worsens Fire Risk In Parts Of Western U.S.
As with most extreme weather and climate events, and their related impacts, major wildfires require several factors to come together in order [to] occur -- typically some combination of dry and windy weather, abundant and dry vegetation, and a spark, which can range from a carelessly tossed cigarette to a lightning strike. Wildfires are a naturally occurring phenomenon closely tied to climate conditions, and as the world warms in response to rising amounts of greenhouse gases in the air, many studies show that wildfire frequency and severity will likely shift as well. 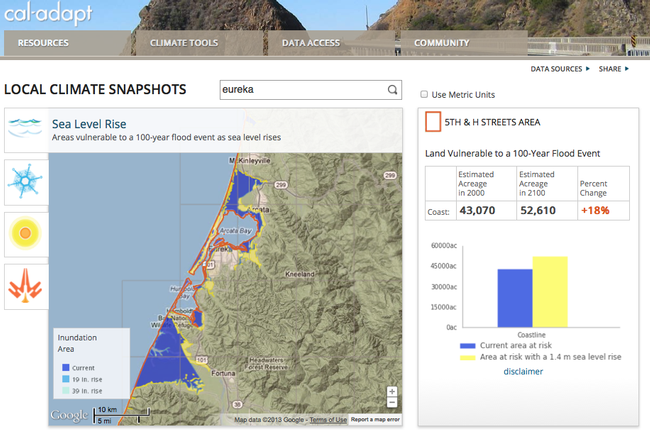 Living with present-day levels of fire risk, along with projected increases in risk, involves actions by residents along the urban-forest interface as well as fire and land management officials. Some basic strategies for reducing damage to structures due to fires are being encouraged by groups like National Firewise Communities, an interagency program that encourages wildfire preparedness measures such as creating defensible space around residential structures by thinning trees and brush, choosing fire-resistant plants, selecting ignition-resistant building materials and design features, positioning structures away from slopes, and working with firefighters to develop emergency plans. Why is housing loss to wildfire relevant? During an interview about our recent paper on housing loss due to wildfire, I told the reporter that I was from the Conservation Biology Institute. She hesitated for a moment, and then asked the question that naturally followed: “If you’re from the Conservation Biology Institute, then why are you studying factors that contribute to housing loss?” This question made me realize that the answer might not be readily apparent, especially to those who are unfamiliar with fire ecology in southern California. My coauthors and I are concerned about community vulnerability to wildfire, and this paper is the first publication from a much larger project, the USGS Southern California Wildfire Risk Scenario Project. Although one of the main components of this project is to identify the key factors that minimize housing loss, another major goal is to find solutions that balance management of fire hazards with natural resources – and ideally, identify ways to benefit both. There are a number of reasons why housing loss to wildfire is strongly linked to conservation, and these tend to fall into three main groups. Throughout the US, particularly in the west, highly successful outreach about the perils of fire exclusion has led to the common belief that more wildfire is needed for its ecological benefits. However, for those of us who study non-forested, crown-fire systems, like the shrublands in southern California, the opposite is true. During the last several decades, human-caused ignitions have escalated due to population growth and urban expansion, and fire frequency has thus skyrocketed in the region. Although many native species in southern California are resilient to periodic wildfire, the vegetation here is actually adapted to a fire regime with much lower fire frequency than in most conifer forest systems. As a result, many species cannot withstand high-recurrence fire, especially if a fire repeats within 5 – 15 years. Increased fire frequency not only contributes to the elimination of native shrubs, but it also imperils the many mammals who depend on shrubland habitat, and furthermore increases the potential for expansion of weedy, highly flammable annual grasslands. As a biodiversity hotspot, southern California is home to the one of the largest numbers of threatened and endangered species in the US. 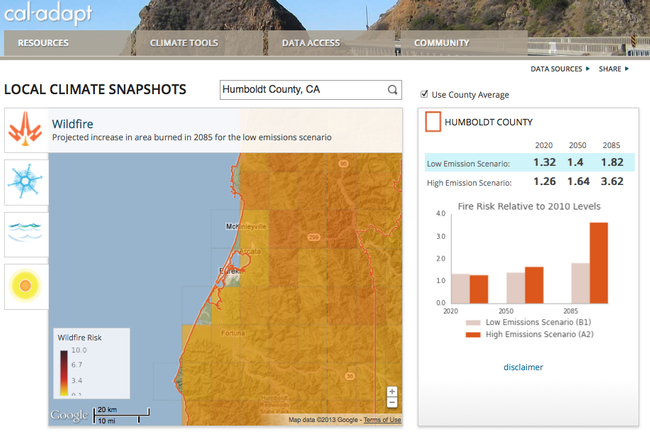 Because the vast majority of ignitions are caused by humans in California, population growth and urban development have direct effects on the number of fires that occur. If future development occurs in a way that not only reduces risk of home loss, but also reduces the number of fires that start, people and natural resources will both benefit. The most obvious and accessible approach for dealing with wildfire risk is to manage vegetation, or, the fuels that carry the fire. Thus, reducing the volume and extent of fuels is usually considered to be the most important aspect of fire management. In forested ecosystems, this approach presents few problems for conservation, and is actually mutually beneficial for reducing fire hazard and providing ecological benefits. Unfortunately, this ecological benefit does not extend to non-forested, crown-fire ecosystems. In southern CA, fuel treatment typically involves complete elimination of native shrubs in preference of exotic grasses and low fuel-volume vegetation. These treatments facilitate the expansion of exotic species, and prescribed fire adds more fire to a landscape that is already suffering from an exorbitant amount of fire. Fuel treatments also fragment important habitat for mammals. Aside from the negative ecological impacts, these fuel treatments unfortunately provide insufficient protection to homes during the types of fires that lead to the most home loss – those under extreme weather conditions, with Santa Ana winds. In these weather conditions, fires will not stop at a fuel treatment; in fact, flying embers have been known to jump major multi-lane freeways. Therefore, our project is seeking solutions to substitute sole reliance on fuel treatments with a combination of approaches that not only provide the maximum public safety, but also reduce resource impacts. We are finding that the best solutions will not only include strategically placed fuel treatments near homes that provide firefighting access, but the addition of land use planning and other measures, like fire-safe landscaping. Perhaps the most obvious reason that land use planning and housing loss are related to conservation is the potential for direct habitat loss and fragmentation brought on by development. This is true not only for California, but for any fire-prone region in the world. If new homes are constructed, this will clearly expand the footprint of development and remove habitat to clear the land. And of course, there will simply be more homes available in the landscape to burn. However, given a fixed number of new residences that need to be constructed, our research is finding that the location and pattern of those homes makes a very big difference in whether or not the homes will be destroyed in a wildfire. In particular, homes in low- to intermediate housing densities, in small, isolated neighborhoods, are the most at-risk, at a landscape scale; however, once a fire reaches a community, there is potential for house-to-house spread if the homes are too close together. Because scattered, low-density housing typically results in larger conversion of habitat, these results imply that building new homes in existing urban areas or in larger, high-density clusters may not only make the homes safer, but can also minimize habitat conversion. Considering the tremendous economic impact of wildfires, from costs of fuel breaks and firefighting to property loss and fire insurance, we are finding that, like with so many other issues, ecology and economy (and in this case, public safety) really aren’t enemies. In fact, what’s good for one can be good for the other, and we are identifying solutions that are beneficial in all aspects. In southern CA, large wildfires are simply unpreventable. But we believe there are ways we can learn to live with them.